First one to say geom_ribbon loses. I was plotting some data for a colleague, had two lines (repeated experiment) per person (time on the x axis) facetted by id, I thought it’d be nice to shade the area between the two lines so that when they were deviating you’d see a large shaded area, and when they were close there would be little shading, just to aid the visual of the separation between repeats. I thought this would be trival, and geom_ribbon would do the trick, alas, some of the lines crossed so that didn’t pan out. Ignoring the ‘experiment/order’ variable and reordering the data to track the max and min values at each time point doesn’t work, because when they cross you end up with a box around the cross, rather the inside region being shaded. I did think this would have been done before, but I couldn’t find anything that resuable. There was this blog post but like user Aniko mentioned in the comments, that was essentially finding the midpoints by hand, which seemed a bit clumsy (not saying the below is any better). Aniko’s solution used a package gpclib to create polygons for each block of colour, which was about where I got to when looking for a ggplot strategy. 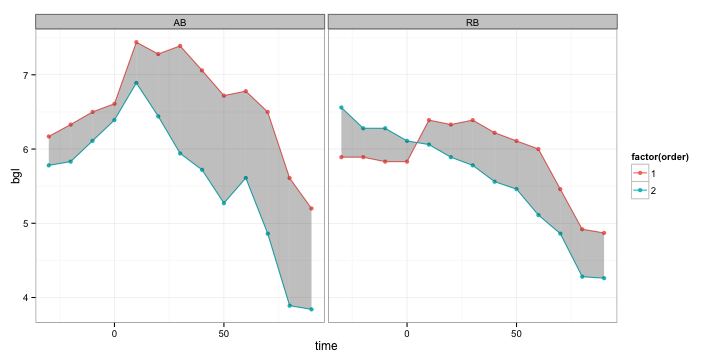 I played around a bit and couldn’t get the gpc.poly data to work with ggplot, so put together a couple of small functions to essentially do the same thing. So here’s the code and output. I wrote this post in RStudio using the R Markdown language and then knitr to turn in into markdown (.md), and then pandoc to turn it into html. The original file is available here on github. As an aside, the mgroup function might seem like overkill, but it was a bit tricky, as when the lines cross you have to be careful to get the right ‘hourglass’ orientation, either vertical or horizontal.